Hopkinton – Colonel Martin A. Hunt, 84, of Hopkinton, formerly of Northborough, died at home Wednesday, Oct. 1, 2014, surrounded by his loving family. He leaves his devoted wife of 60 years, Dorothy A. (Reidy) Hunt; six children, Kevin Hunt and his wife Cindy of Virginia, Karen Dreher of California, Martin Hunt and wife Karen Morand-Hunt of Lancaster; Maureen Hunt and Steven St. Aubin of Taunton, Joanne Fornear and her husband John of Pittsburg, Penn., and Annmarie Farrell and her husband Richard of Ashland; 15 grandchildren; three great-grandchildren; and numerous nieces and a nephews. He was predeceased by two brothers and a sister; Robert Hunt, David Hunt, and Sister Mary, formerly of The Sorrowful Heart in West Springfield. Born and raised in Worcester, he was the son of James and Nora (O’Reilly) Hunt. He graduated from St. John’s High School in 1949 and Worcester Central College, and earned his Associate’s Degree in Business Administration in 1952. 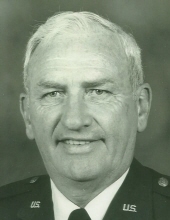 He and his wife Dot raised their family in Northborough, where they resided from 1968-2010. Years ago, Marty worked as sales manager for Westinghouse Electric Corp. and Motorola Inc. He spent his military career with the Massachusetts Air National Guard. Highlights of his distinguished career included Commander of 212th Engineering Communications Installation Squadron and 267th Combat Communications Squadron, Wellesley ANG Station. As Commander of the 267th, his unit was recognized for numerous Federal/State awards. Marty served as president of the Marlborough Country Club from 1988-1993. An avid golfer, he was a former senior club champion and father-son champ at the Marlborough Country Club. Calling hours will be held Sunday, Oct. 5, from 3-6 p.m., in Hays Funeral Home, 56 Main St., Northborough. A funeral Mass will be celebrated Monday, Oct. 6, at 10 a.m., in St. John the Evangelist Church, 20 Church St., Hopkinton. Burial with military honors will follow in MA National Cemetery, Bourne. In lieu of flowers, memorial donations may be made to the Alzheimer’s Foundation of America, 322 Eighth Ave., 7th fl., New York, NY 10001. For the online guest book, please visit www.haysfuneralhome.com.